Governor Roy Cooper briefs the media on the destruction caused by Florence. 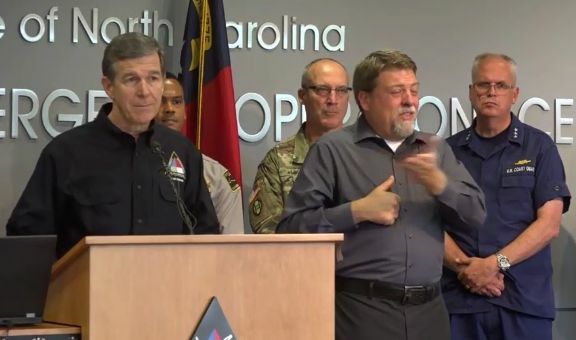 Less than a week after Hurricane Florence battered North Carolina, Governor Roy Cooper announced Thursday evening that he would bring legislators back to Raleigh in special session to address recovery needs. In a statement issued by his press office, Gov. Cooper said he would be issuing a proclamation requesting legislators to return Tuesday, October 9th. Cooper is working with local communities, stakeholders as well as the appropriate state agencies to compile a more detailed legislative appropriations request. Work is also underway with North Carolina’s congressional delegation to put together the state’s federal assistance request. On Wednesday, President Donald Trump traveled with Cooper to get a firsthand look at the devastation. Gov. Cooper, one way to fund the recovery is to truly recover our Southern common sense. We weren’t born yesterday. We know that Duke Energy customer’s understand climate crisis better than you think we do. We can’t very well cry “ain’t it aweful” when we know that continued investment in fossil fuels created the crisis in the first place. Isn’t the gulf Stream slowing down? Didn’t the oil spills into the Gulf of Mexico have something to do with that? Coal ash is flowing in the Cape Fear and NC regulators and Duke Energy customers need to get the big picture and connect the dots and understand that when the Gulf Stream slows down, the rain isn’t going to move out and over as quickly. When Duke Energy refuses to invest in solar and wind energy, we’ll have more, stronger storms, because they were allowed to disturb the land, water, and air with gas pipelines. How much more suffering do you expect “customers” to experience because NC has invested in dirty energy instead of ways to keep our water clean?????? The facts are that some places and people will never recover from Hurricane Matthew or Hurricane Florence.